I got this well over 20 years ago early in my military career and like an old friend, it has been with me in alot of different places and situations around the world. However, it is worn, tired and in complete need of a redo. I plan on getting it completely redone and expanded upon. Will post a before/after photo upon completion. Hi Steeleagle, great to hear from you! Hope you're doing well :-) This last year has been crazy - moved back to the UK, had a sweet little baby boy, and moving house again at the end of the month! dont change that at all! 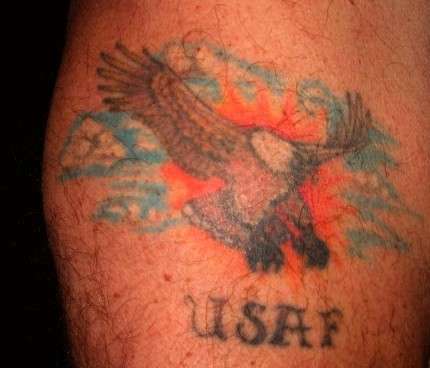 youre an old military guy with a couple old school tattoos. Leave them be and just get some new stuff. I agree with Sandie add new stuff around it but leave that one just the way it is to remind you of all that you and it have been through.